The truth is that our society has developed a negative stigma around mental health and what’s worse, the stigma seems to attach itself most to thoughts about suicide. That doesn’t have to be the case though. We can all join together to break down that stigma and welcome those struggling with depression, hopelessness, pain and thoughts of suicide so they can get the help they so desperately need and deserve. There’s nothing worse than hearing about a child or teen who has gotten to the point that suicide makes sense to them as the way to deal with their suffering. Everyone encounters bad times, but youth should be a time of growth. A time when we learn how to deal with adversity and setbacks rather than allowing them to crush us into hopelessness. There’s so much that could be said on this topic, but our purpose here is to explain that no matter how hopeless or painful your world seems, there is help available. You’re never alone unless you chose to be. Mary Karr wrote a poem in which she said, “Your mind’s a dangerous neighborhood: don’t go there alone.” This is the most true when we get to the point that rational thought gives way to despair. 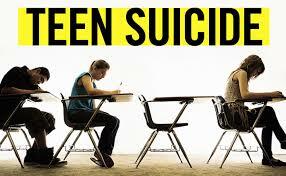 Most people have thoughts about suicide at some point in their life, children and teens included. Such thoughts can come about when we feel our problems have overwhelmed us and we feel trapped. We can and should talk to someone who can listen and help us before thoughts of hopelessness and despair take over. Most people who consider suicide don’t want to die, they just want to stop feeling so miserable. They may feel depressed, confused, alone, or just full of emotional pain, but whatever the feelings, people who have reached that level of despair in their lives are no longer thinking clearly. If you or your friends are feeling this way and have had thoughts of suicide or know someone who has, the most important thing to do is to talk immediately to an adult you trust. Remember, keeping a secret about suicide or someone who is thinking of suicide doesn’t help anyone. In fact, it can actually make things worse. Friends help friends, so when someone tells you something that worries you, tell a trusted adult right away. If you don’t know an adult who would be helpful, call the National Suicide Prevention hotline number at 1-800-273-8255 and they will help you figure out what to do. If you’d just like to talk more about your feelings or the concerns you might have about a child or teen’s feelings of depression or thoughts of suicide, call us to schedule an appointment.